The film is a bit of a high-wire act completed with the precision and flair of a Wallenda. 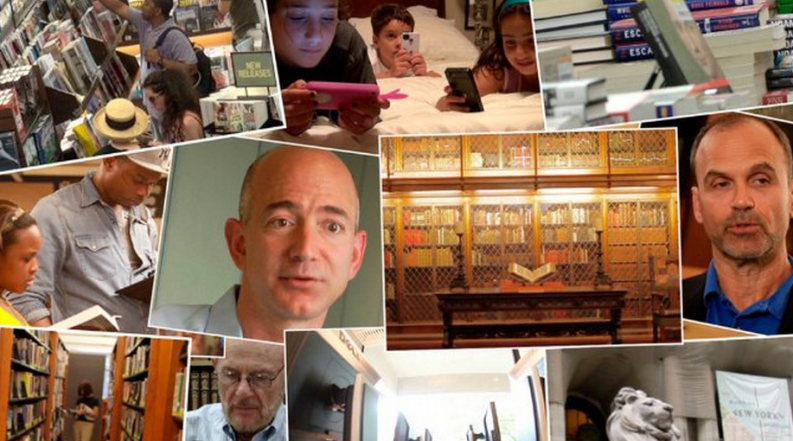 At any point this documentary could have fallen into a “two-camps” debate between Amazon’s founder and CEO Jeff Bezos (who does play the “mad-genius-who-is-only-out-to-help-you” part well) and Scott Turow (who sets aside his best-selling author hat to wear that of the head of the Author’s Guild, thus becoming Amazon’s mortal enemy). Sure, there is lots of overstatement like “Do I think that people read full books now? No. Unless it’s a Danielle Steel novel.” (that’s John Perry Barlow of the Electronic Frontier Foundation), and Ray Bradbury “confesses” that he wrote Farenheit 451 in a library in nine days (surely an example of the Intentional Fallacy), but that is part of the film’s charm. Part history, “Writing was invented as an administrative technology, a bureaucratic technology that was one of the solutions to the problem of urban density and complexity” (from scrolls to codices — “the precursor to the book around the time of Christ”—to the invention of moveable type), part invective (Turow and the Authors Guild vs. Bezos and Amazon), and part Horatio Alger-story (Darcie Chan discusses self-published New York Times Best-seller The Mill River Recluse — and why her next book is with a General Trade Publisher), Out Of Print, like a good book, packs a lot of information, if not wisdom, from many different sources (“experts”) into only 55 minutes (plus 20 minutes of “extras”). The book as tool is treated well, and when Bezos waxes “when you get into a book, the book disappears” sounds equal parts sincere and creepy. But he concludes, “The physical book is a technology,” Something that, in the hype of the sea of numbers concerning people reading on tablets, smartphones, MacBooks, Kindles, Nooks and Kobos seems easily forgotten: print is still here as ebooks have begun to enter a period of maturity in the US and UK (read: leveling off). “The next big change was just yesterday,” Streep warns us. If, by “yesterday” you mean the mid-1990s and the invention of The Everything Store (to use Brad Stone’s term for Amazon). When Bezos is asked “What format do you read in?” He responds, “Isn’t that an odd question? Could you even imagine asking that question ten years ago?” And then a group of teens talks about how they don’t read books, but simply access information on Google when it comes time for homework. E-books account for 31% of publishing revenue for adult fiction. “So the printed book is doing very well, thank you—but individual publishers are doing miserably.” That’s Robert Darnton, the director of Harvard University Library. La mot juste. “But that doesn’t mean the end of publishing”. “At one point I thought it was an evolution…but it’s a revolution” opines OpenRoadMedia’s founder Jane Friedman. And she’s probably right. (Depending on how you define “revolution”). “Ebooks take no time to produce” and “buying things online is something we all do,” Friredman continues. And she thinks (correctly) that traditional publishers just wanted to ignore ebooks until it was too late and then they started “running scared—and that’s when mistakes get made.” Indeed, trade publishers made plenty of mistakes post-Kindle. One thing that the film does not do—to its credit—is look back at a time when the bookselling was a sane business model. Any business where the producer ships its product free-frieght and, if the retailer can’t sell the product, can send it BACK—was never a great way to do business (I can’t think of another industry that would continence such a set-up where the retailers have such power). If this really is a “revolution” perhaps this practice will go the way of Borders and Books-A-Million. Darcie Chan’s—who is interviewed in the film and who took questions at Digital Book World earlier this year– describes The Mill River Recluse and how it became a best-seller. She is either a model of how to become a best-selling-author without investing a ton of money (“I spent about $1,000”), or simply the benefactor of good luck (and good algorithms from Amazon). Still, it’s a story well-told, but any self-published author who thinks they can do the same is, if not delusional, dreaming. Self-publishing is fraught with paradox, to say the least. As are the remaining independent bookstores. “There were 6,500 Independent bookstores in the U.S. in 1991. By 2012 they fell 70%.” The owner of New York’s famed “The Strand” bookstore, Fred Bass states without qualification that “there is no way we can compete with Amazon or Google.” There used to be 48 independent bookstores running from Union Square to 8th Street in New York City. Only the Strand—and Barnes and Noble—are left. Are we all at a loss of what to do? The changing face of the library and “what-is-a-library-good-for-anymore-anyway?” shows a sea-change perhaps even greater than that of indie bookstores. While one might go to an independent bookshop to support a local merchant, there’s not much reason to visit your library for the reasons one did in the pre-Internet days. “Libraries are great meeting places and I think that needs to be more developed today. But this return-to-Athens attempt flies in the face of decades of bespectacled librarians with halitosis shushing everyone. Still, many examples of how libraries are evolving (or “revolutionizing”) are interesting, if not quite exciting. Jeffrey Toobin’s statement “Google may be in a position to exercise too much power” is perhaps the greatest understatement in this documentary, but it is teased out to the point that one would have to be naïve to believe that Google only has the public’s best-interest at heart. “Google is reversing the Carnegie model of making information available to the masses—but the masses have to pay for it”. The film provides a good primer on Copyright Law, and how Google has violated it. Also, there’s a nice introduction to the DPLA (Digital Public Library of America)—the key word here being “Public” as opposed to Google’s “Private”—and Turow, is opposed to both on the grounds of Copyright. In the midst of all this it is good to remember that at its heart copyright law is quite simple: it is literally the “right” to make “copies” of a work. And it springs into being the minute the work is created (no patent application needed). And the right belongs to the author. Perhaps this is so, but I find this at best difficult to believe given the ubiquity of wattpad, medium and other ways of reading that have grown in the past two years. And the scary-sounding statistic, “46% of American Adults cannot understand the label on their prescription medicine” is misleading in that 1) it’s from 1999, and 2) “understanding” prescription label is difficult for anyone, no matter how “literate” you are. Bezos agrees that there has been a shift from “long form reading…toward short-form reading” and it’s hard to argue against that point. But “are we reading better or just accruing information without true knowledge?” Professor Wolf of Tufts wonders aloud. The conventional wisdom that more people are reading more “content” in many more different forms is probably true—and that this takes a bite out of time spent sitting down and reading a hard-cover novel. One of the real gems of this remarkable documentary is Ugo Rozzo, a professor of History of Book and Print at the University of Udine, who punctuates the film a few times and speaks (in Italian and with much gesticulation) of “the risk…of culture in capsules, information that is fragmented, divided, without having the complete vision.” This may ultimately lead to a type of illiteracy. However, and this is the beauty of the balancing act of Out of Print, a Kansas State Professor—a self-professed member of the MTV-generation—claims that “a good story still holds kids’ attention.” And, despite what you think of the prose-style, the YA market is rife with multi-million-selling book-hits from the almost endless Harry Potter Series, Twilight, Divergent, and Hunger Games. If nothing else, Young Adults are showing loyalty to these stories as well as stick-to-it-tive-ness to finish the series. “In the end, it all comes down to education. Students are the future of reading” Meryl Streep voiceovers. It’s hard to argue with this obvious fact, but Out Of Print’s ending, which seems like the flip side of Season Four of The Wire, tends towards the easiest answers about education, which is perhaps the thorniest problem (whether it’s the Teacher’s Union’s choke-hold on public education or the usurious sums demanded from private schools). Still, Out Of Print is an exceptional work, worth seeking out and viewing. Though it is not, one would assume, better than reading the book…had there been a book version.